At the heart of digital marketing is useful content. When people do research, they search for useful content on the Internet. They look for how-to guides, case studies, and resources that can help solve their problems, inspire them, or point them in the right direction. Writing content that is both free and useful endears you to your market and establishes you and your business as the authority in your niche. The list post is simply that, a list. Some may affectionately refer to it as a “listicle.” A list post is one of the easiest to put together and can be very versatile. Not to mention that people just love lists — they’re helpful and quick to read. For your blog, create a list of books, tools, resources, or any other topic that your market finds useful and is also relevant to your call to action. Typically, list posts have quick introductions and then get right to the body of the post. By their nature, list posts are text heavy, which can be intimidating to readers. Be sure to use images wherever you can, which helps to break up the text, making your post easier to read and more likely to be shared. The term case study carries more perceived value than the term article, blog post, or video. Case studies provide great detail and go beyond simple testimonials by showing real-life examples. Using case studies, you can highlight your successes in a way that helps you turn a prospective customer into a customer. In the case study post, get specific and talk strategy. Outline and unpack the details of something, such as a project, event, or process. Tell your story from start to finish, including the failures and “speed bumps” that you face; doing so offers authenticity to your case study post and makes your brand more relatable because it proves that your brand is composed of humans with faults, just like the rest of us. Finally, be sure to include real numbers, graphs, and figures that back up your examples. 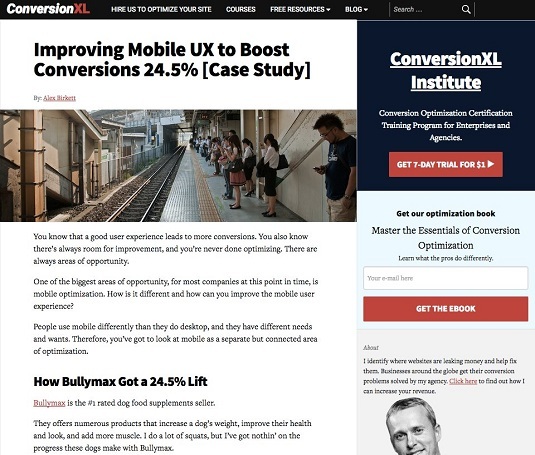 Here’s a case study post from ConversionXL. An excerpt of a case study post from ConversionXL. The how-to post is another staple blog post type. In the article, you describe how to execute a process and use images, video, or audio to enrich the post and make it as easy as possible for your reader to take action. This type of post contains a quick introduction and then gets into the process you’re presenting; you might outline your process in the intro in the form of a bulleted list before going into more detail in the body of the post. It can help to break the how-to information in the body of the piece into steps, phases, or categories so that your readers can digest the information more easily. The FAQ post is a great way to bring traffic to your website from search engines. If you continually get repeat questions from customers or prospects, there is a good chance that people are using search engines to find the answers to these same questions. Create articles with detailed explanations around these FAQ topics. The SAQ post is a variation of the FAQ post. This is a question that customers or prospects don’t ask — but they should. For example, a real estate company could create a post called “Questions You Should Ask Before Hiring Any Realtor.” Your SAQ post should center around questions that customers should ask before they buy your product, or questions they should ask to learn more about your industry. As the name suggests, a checklist post lists the steps a person should take to complete a specific task. For example, an airline blog might post a checklist containing the items people should bring when traveling abroad, or what parents should bring to keep young children entertained on long trips. If you can break your content down into a checklist, it often performs better. People like the checklist format because it’s easy to digest, and people find taking action easier when you itemize the content in this way. This type of blog post has an easy format: First, define a problem; then present the solution. The solution to the problem might take the form of a product or service you sell, or it may be something that people can freely obtain. The problem/solution post is a valuable piece of content because people are always looking for ways to solve their problems. If you can provide a real solution for someone, that person will be grateful to you. The problem/solution post can cross over into the territory of other blog post types such as the FAQ post, the how-to post, or the checklist post. Conducting your own primary research around a topic in your niche is one of the best ways to build blog content that gets attention. That’s because primary research is hard to gather and extremely time consuming. Collecting all the research for someone and providing it for free all in one place is a great way to endear your brand to prospects as well as establish your brand as an authority on the particular topic. That said, you don’t have to do all the research yourself. You can simply curate research from third parties and pull it together into an article, infographic, or other type of content that your market will find valuable and intriguing. This post (like the research post) works best when you can use statistics that you have produced because it adds to your authority. That doesn’t mean you can’t use third-party information, but if you’re looking to build awareness and clout around your brand, using your own statistics is the way to go. That said, don’t ignore other resources altogether. Consider pulling together stats from multiple locations to create a very solid, well-rounded statistics post. The ultimate guide post is just what it sounds like: a detailed, comprehensive post on a topic in your niche. An ultimate guide post done right is an article that people will bookmark and continuously return to, so don’t skimp here — take your time and deliver the definitive post on the topic. This type of post helps to bring people back to your site, establish you as an authority in your market, and prove that you know what you’re talking about. The idea behind the ultimate guide is that the reader shouldn’t have to go anywhere else to gain more information on this topic. This post will be long, with thousands of words, and many figures and examples. If people can read and digest this post in ten minutes, it’s probably not the ultimate guide. Look for opportunities to break a topic into a series. An exceptionally lengthy or complex piece (such as the ultimate guide post) is a good candidate to be broken into parts and distributed as a series post. Announce in the introduction of the post when readers can expect the next article in the sequence to be published. Also, you should have set days when you publish the series. For instance, make it each day over the course of a week, or every Monday over the next month. By announcing and having a set time frame, your readers know when to expect the next part, which helps to maintain engagement in the post. Be sure to link these articles together as you publish them. That way, if people miss the first or the second part of the series, they can easily find the post(s) needed to catch up. 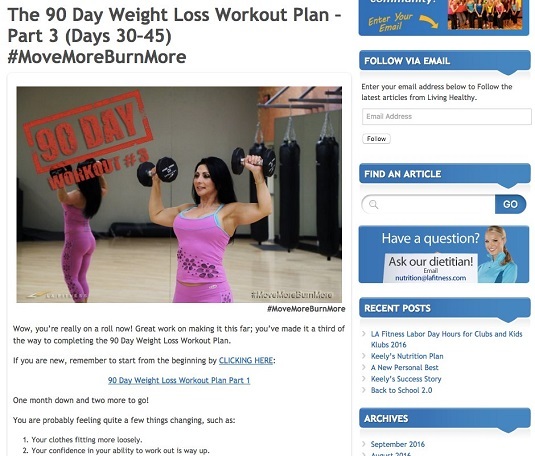 Here’s an example of a series post from the health club chain LA Fitness. An example of a series post from LA Fitness. In niches in which the market needs to be educated, the definition post is an absolute must. As the name suggests, it’s an article that defines a topic, and it works well in industries and markets that have their own terms and lingo. For the definition post, you can create content around a particularly confusing or complex topic and then explain and inform your readers about that topic. For the definition post, consider creating a series of posts that define aspects of your niche. You get bonus points if you can logically define something in your market that is unique, unusual, or controversial. Presenting one or more of these aspects helps you stand out while also creating engagement in your post. This post leverages a popular YouTube video to create stellar content. It can be your video or, if you have permission, someone else’s video. To create this article type, take screenshots at different stages during the video and add text explanations. Then embed the entire video into your post. This is a super-fast and easy way to create high-value and engaging content from video.